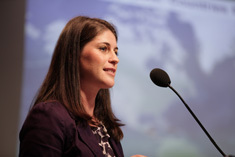 “Maps are inherently compelling because they contain a high resolution of information and most people have really been trained since grade school on how to read a map,” says Population Action International mapping specialist Gina Sarfaty in this week’s podcast. “At PAI we were creating traditional publications and realized that climate change findings scattered across different publications would be useful and compelling to show in one place.” Sarfaty has helped PAI, a reproductive health advocacy NGO, build an interactive website illustrating overlapping data sets on climate change vulnerability, projected declines in agricultural production, and rapid population growth to show “hotspots” where improved access to family planning could help alleviate a number of pressures. The intention of the website, Sarfaty explains, is to bridge PAI’s advocacy campaigns with its research. A guided tour section of the site has a set of pre-made maps accompanying a specific narrative. The linear format keeps “the messages clear and accessible to users, so that they aren’t left trying to put the pieces of the puzzle together to really figure out what the key takeaways are,” she says. But there is also a do-it-yourself, “explore” section where users have access to additional data and can draw their own maps and conclusions. The site also serves as a dissemination tool for PAI’s partners in developing countries, says Sarfaty. “Often there was a challenge of a mutual understanding of terms, but it was great to be able to customize maps and send them over to our partners to make sure that they were getting things that were effective.” Because many of their partners work in places with poor or unreliable internet access, Sarfaty says they made sure the maps can be distributed via hardcopy, USB drives, or email. Sarfaty spoke at the Wilson Center on September 30. Download her slides here.